By now, anyone involved in electronics recycling knows the CRT story all too well. As technology for computer monitors and TVs transformed over the last two decades, the older lead-laden cathode ray tubes (CRTs) that entered the waste stream had limited appeal for end users and could no longer be easily moved through the market in a profitable way. Property owners spent millions of dollars cleaning up CRT storage sites left behind by shuttered East Coast processor Creative Recycling Systems. But E-Scrap News, sister publication to Resource Recycling, confirmed in February much of the glass went to companies that ultimately failed and abandoned stockpiles of their own. Closed Loop and GES received more than half of Creative’s stockpile and have since closed, leaving behind millions of pounds of their own CRT glass. Both firms have been the subject of lawsuits and regulatory action. Kuusakoski continues to operate its CRT operation. Finally, officials in South Carolina confirmed that 6.7 million pounds of material had been removed from Creative’s former site in Blythewood, S.C. The state said it was not aware of where the property owner sent the material downstream. “They were no longer turning the glass into a new CRT and they didn’t need the volume they previously needed,” Gloyd said. In January, state officials in Iowa announced they were filing suit against an electronics recycling operation accused of stockpiling and improperly managing millions of pounds of CRTs. The Iowa Attorney General’s Office sued Recycletronics, a Sioux City, Iowa-area e-scrap company that closed last year. The state seeks civil penalties and financial payments, claiming Recycletronics had stockpiled nearly 17 million pounds of CRTs and other electronics since 2013. In at least one unpermitted storage site, Recycletronics delivered boxes of glass that were later dumped out and burned, the lawsuit alleges. Any metal content was removed and the remnants were dumped on the ground. The U.S. EPA, which has been monitoring the company’s sites in recent years, estimates that nearly 1.2 million pounds of leaded glass materials are mixed in with the soil at that unpermitted location. The firm, led by Simon Greer, struggled to clear regulatory hurdles related to its accumulation of CRT material in New York, Pennsylvania and Virginia. Greer told E-Scrap News the company, which was founded in England, was nearing completion of a multi-million-dollar cleanup effort in Pennsylvania and would be focusing on cleaning out its Bristol, Va. and Dunkirk, N.Y. sites. According to Greer, the undoing of the company ultimately came in March, when the Pennsylvania Department of Environmental Protection ordered the company to remove more than 17 million pounds of glass in storage by February 2018. 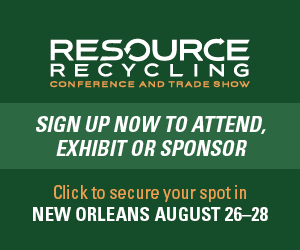 Bobby Elliott is editor at large for Resource Recycling and can be contacted at [email protected]. Colin Staub is the publication’s staff writer and can be contacted at [email protected].